Samsung has launched the Galaxy A8+ in India today, as an Amazon Exclusive, starting at Rs 32,990. The device will go on sale from January 20, and while the A8+ has been launched more details are awaited for the Galaxy A8, the slightly trimmed-down variant. 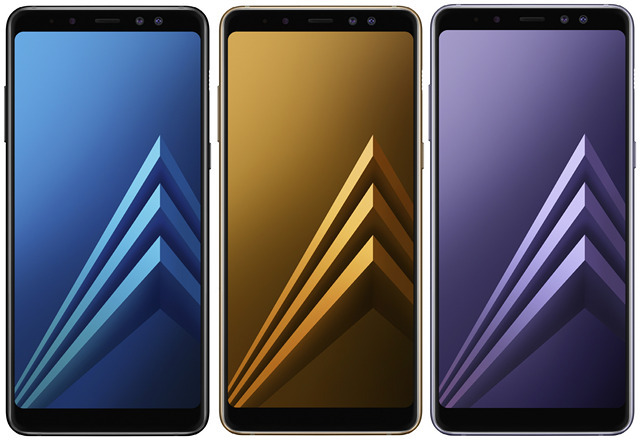 Samsung has added a bunch of features to the Galaxy A8+ that are usually reserved for the S-series of flagships. These include Infinity Display, metal-and-glass body, dual cameras and Live Focus mode. Here’s a closer look at its features. 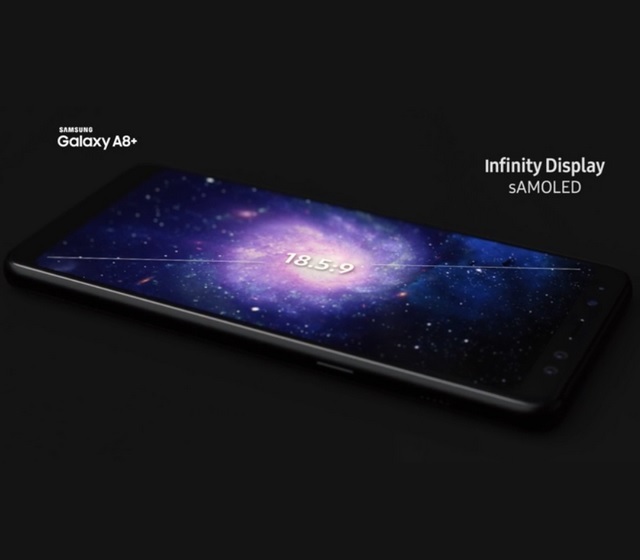 The Galaxy A8+ is poised to be the first non-flagship device from Samsung that will feature the company’s signature Infinity display – Samsung’s very own take on the bezelless trend. The upcoming smartphone will pack an Infinity display with an 18.5:9 aspect ratio. The screen diagonal measures in at 6-inch with a resolution of 1080 x 2220 pixels and thanks to the ample screen real estate, the A8+ is claimed to offer ‘a stunning cinematic experience’ when it comes to viewing videos. The Galaxy A8+ will come with the Exynos 7885 octa-core CPU (2×2.2 GHz Cortex-A73 & 6×1.6 GHz Cortex-A53) and features the Mali-G71 GPU. Users get a choice of either 64GB internal storage and 6GB RAM or 32GB of capacity with 4GB RAM. The rear-mounted fingerprint sensor is placed in the centre of the phone, unlike last year’s phones which had it towards the top and to the right of the body. This arrangement is likely to repeated for the upcoming Galaxy S9 and S9+. Aside from the stunning display, the Galaxy A8+ will also boast of a feature that no Samsung smartphone, not even the flagship S-series and Note devices, can claim to offer — dual front cameras. 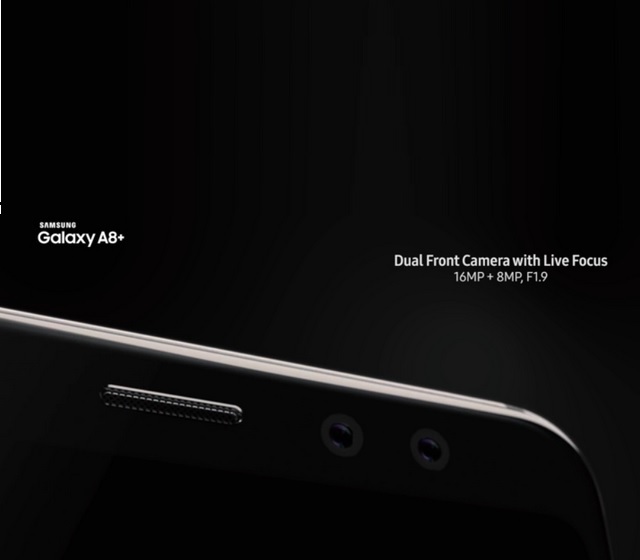 The Galaxy A8+ marks the first instance of Samsung equipping a Galaxy smartphone with a dual-camera set-up on its front side. The upcoming device’s front snappers are a 16MP + 8MP setup, and they are backed by Samsung’s Live Focus photography assistance algorithm for cool effects on your selfies. The primary camera is a 16 MP unit with an f/1.7 aperture, featuring phase detection autofocus as well as a single LED flash. It can record [email protected] videos. The front camera is also capable of taking 1080p videos. Another standout feature of the upcoming Galaxy A8+ will be its build quality. The Galaxy A8+ will feature a metallic frame with curved corners, and chamfered edges for improved grip. We are just finishing our first impressions of the Galaxy A8+ after a brief hands-on time at the launch event. Stay tuned for the unique Beebom take on the latest Samsung smartphone to hit India.